The ESL vs. bilingual education debate has existed since the 1800s when the U.S. began to experience a great influx of immigrants from around the world. Questions arose as to which was more beneficial, more economical, better for the immigrants' assimilation and better for the native English-speaking students. For which do we have already capable teachers? For which do we have more trainable teachers? The debate has continued in fits and starts to this day, but what it boils down to is that neither is necessarily better. They're just different. The goal of ESL education is to teach English to students whose native language is not English. An ESL classroom could comprise students of any number of language backgrounds, but they are all there to learn English. As such, the teacher is only required to speak English and does not need to know the native languages of all the students. In a public school setting, ESL instruction is provided in a few different ways. In an ESL pull-out program, ESL students leave their regular classroom for a short period each day or week to receive ESL teaching or tutoring. Sometimes, they are pulled out individually and sometimes in small groups. The ESL teacher may have his own curriculum, or he may tutor the students in their regular classroom subject matter, helping them to understand the English involved and/or to devise strategies to better learn and keep up with their work. Pull-out programs are mostly used in school districts where ESL teachers are spread thin across several schools each, where the ESL population is not very large, or where classroom space is limited. In middle and high school settings where students move from classroom to classroom for each course, ESL students may have their ESL class in place of an elective, or it may serve as their language arts course. Either way, they don't miss out on anything that happens in another course, as in pull-out programs, and they receive course credit upon successful completion each year (or semester). Sheltered English, also known as content-based English instruction, is a special type of program not entirely unlike bilingual education, where the teacher(s) of each subject or grade level teach the required curriculum of that grade level but with modifications made to accommodate ESL students. 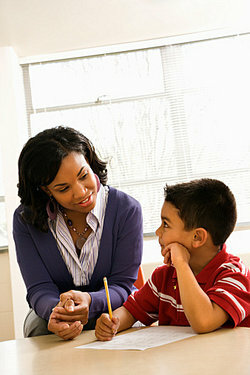 The teacher gives the lessons in English, teaching Math, Science, Social Studies, Civics, English, History, etc. Main goal is to teach the content with a secondary goal of teaching English. Teachers in such programs will modify the regular curriculum only by simplifying the language with which they present it. They may also make use of visual aids, gestures, hands-on activities, group work, games, and other teaching tools not used in regular classrooms to get their students to a place of understanding. If a qualified teacher is available and the number of ESL students per grade level or course is sufficient to fill one class, then sheltered English is the best of both worlds. The students are keeping up with grade-level curriculum while learning English as opposed to being removed from one in order to work on the other. Unfortunately, teachers qualified, patient and willing to teach both ESL and a subject are hard to come by, so this is not really a viable option for most schools. In a bilingual program, the non-native English speakers all have the same language background, and the teacher speaks both languages as a means of content instruction. In the ESL classroom, the students come from various language backgrounds, and the teacher only speaks English. There are two types of bilingual education, and both have a main goal of teaching English to non-native speakers while also teaching the necessary grade-level or course curriculum. The students are placed into classes based on their native languages. The teacher teaches both in that language and in English, slowly phasing out the students' native language and eventually teaching only in English. The idea is that the students will be comfortable in the learning environment throughout the process, but they will soon enough be ready to join the language majority in regular classes. The teacher speaks two languages, whereas content-based ESL teachers only speak English. The student population is 50% native English-speaking and 50% minority language-speaking. A Spanish/English bilingual program, then, would be half English-speaking and half Spanish-speaking. The teacher would be bilingual and would teach the entire course half in English and half in Spanish. Transition - The Spanish speakers are learning English so that they may thrive in an English-speaking educational environment. Development - The English speakers are developing understanding and fluency in a second language. Maintenance - The Spanish speakers are maintaining their native language and culture, precious things that are sometimes lost when young children speak English more on a daily basis than their native language, causing a disconnect between them, their families and their heritage. Discerning which type of program is best suited to a given student population is not difficult. A simple inventory of students' languages, available teaching staff and space will easily determine if an ESL or a bilingual program is necessary, and when done well, both are excellent ways to learn. "ESL vs. Bilingual Education." YourDictionary, n.d. Web. 21 April 2019. <https://esl.yourdictionary.com/about-esl/esl-vs-bilingual-education.html>. The ESL vs. bilingual education debate has existed since the 1800s when the U.S. began to experience a great influx of immigrants from around the world. Questions arose as to which was more beneficial, more economical, better for the immigrants’ assimilation and better for the native English-speaking students.Which one works faster?For which do we have already capable teachers?For which do we have more trainable teachers?The debate has continued in fits and starts to this day, but what it boils down to is that neither is necessarily better. They’re just different.